Translation is a form of reading in itself, of interrogating the text, and by now, for me at least, the desire to continue thinking about a text is indivisible from the instinct to translate it. Moger at the translation event in London. Robin Moger has translated a range of popular and acclaimed novels, from Ahmed Mourad’s Vertigo to Yasser Abdel Hafez’s Book of Safety, for which Moger won the 2017 Saif Ghobash Banipal Prize for Arabic Literary Translation. He also runs a blog called Qisasukhra, where he presents excerpts of previously untranslated Arabic literary works in English. His two latest translations were of Iman Mersal’s How to Heal: Motherhood and Its Ghosts and Yasser Abdellatif’s The Law of Inheritance, both published in 2018. The process of translating is always different from one book to the next. For Moger, translating is not detached from the process of reading a given book, and it involves engaging with the text on a deeper level. 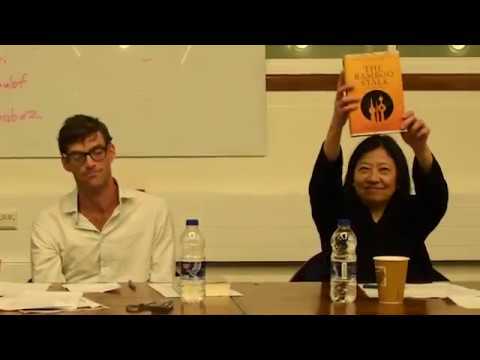 At an event last year in London, Moger spoke with fellow translators Jonathan Wright and Wen-chin Ouyang about each other’s styles of translating and choosing the novels they want to translate. He spoke, in particular, about his process of translating Yousef Rakha’s novel Paolo. And while Moger has finished translating it — an excerpt is available on Asymptote — it’s been hard to find the right publisher. They are very different from one another, but with regards to my interest, my desire to engage with them, they were the same. All the Battles is a very subtle book, it’s language modulated inside a narrow spectrum and its concerns constrained inside the same band, sort of humming. The Book of Safety is broken apart and recursive, from the level of the sentence to its structure. I want, I suppose, to enter into these things, to understand them by inhabiting them: it’s better than writing about them in some ways. While Maan Abu Taleb’s All the Battles follows the career of a man who works in an advertising firm but decides to become a boxer, it becomes much more than a “boxer novel” or “Fight Club in Arabic.” The novel tackles themes of identity and social norms, as well as how it’s possible to move on after failure. The Book of Safety centers on the character Khaled Mamoun, who is employed at the Palace of Confessions and transcribes testimonies. That’s where he meets Mustafa Ismail, another of the novel’s main characters, with whom he falls in. The novel is both political and philosophical, and it creates a dark and disturbing picture of an unknown yet familiar Cairo. It’s hard to see a connection between the novels — except for the fact of Moger being their translator. I guess I don’t ever quite know what ‘the translation process’ is referring to in the abstract. I wish I had some baroque process of preparation and execution, like a superstitious athlete always stepping out of the changing room onto their left foot, or only eating orange foods the day before the contest, but really it is just that I read the book then start writing. I look things up. It’s always the same, though sometimes I do different amounts of these various things in different order. I have to be careful about different things. But in this way it is also quite similar to reading: reading is always the same but then it is always different, too. I tend to like to work through it before I talk about it. Perhaps inevitably, because I wouldn’t be translating the novel in the first place, if I wasn’t already engaged with the text meaningfully and without a sense of fundamental confusion. Which is not to say confusion isn’t extremely important: but that you must draw close to it, and embrace it yourself first. There is a species of humility evident in some writing about translation, which is not humility at all, but strategy: it replaces the need to accept difficulty and obscurity—one’s own unknowns—with a supposedly humble deference to the “answer” that an author can give you. It’s the mirror image of claiming you know everything, because it still asserts that everything can be known in a text, or that there is somewhere to finally arrive. It is also, by this same route, a cunning way of not taking responsibility. Obviously none of this applies always: there are always things you have to ask about. Some authors I know quite well, or have worked on their texts before, and then things are simpler. It feels better and easier to discuss things “afterwards” because then you have something to discuss. Though, as a distant cousin of “there’s no such thing as untranslatable,” there’s my belief that everything can and should be attempted, that this is better and more valuable than asking, that this is how you reorder your thought, or think your way into the text. It is often a shift of thought and a passing of time, revisiting a moment having moved further through the text that sees a hard knot of meaning split and part, to show a fruit. Tugrul Mende is an independent researcher, based in Berlin and works as a project coordinator. He holds a M.A. in Arabic Studies. Mike Pompeo on Latin America Waging Peace?